Use the popular channel the right way. 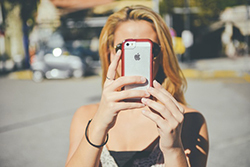 Is your business on Snapchat? Maybe it should be. The image and video-based social media site allows users to share photos (snaps) or videos with their followers. It's similar to sites like Instagram. But what makes this channel stand out—and what could make it lucrative for you—is how fast it's growing. Its active daily user rate, according to Motley Fool, surpasses 100 million and people watch more than 7 billion videos a day on the site. "Snapchat can be a great way to engage with your target demographic and generate buzz around your brand," says Roy Harmon, director of Marketing for Such Ads! "But it's not for everyone—yet." If your business targets Millennials (those ages 18 to 35) or older Generation Z kids (those 12 to 17 years old), Snapchat's a great place to connect with them. If it's not, you may want to turn to other social media sites. Joshua Luft, of Everlasting Wardrobe, agrees. "If your product or service's target market is under 30 years old, then you should have been on Snapchat for the past two years already," he says. And if you're targeting women or girls, Snapchat is definitely the place to be. "More than 70 percent of Snapchat users are female," explains Molly Antos of Konnect Public Relations. So we now know who uses Snapchat, but why is it a good marketing channel for online sellers? Because it's "one of the biggest areas of opportunity for businesses moving forward," says Kyle Reyes, president and CEO of The Silent Partner Marketing. "This social media app has the eyeballs and attention, and if used properly, can not only give behind-the-scenes views into your business, it can help forge tremendous and lasting relationships and drive customers to their locations right now," he notes. Everlasting Wardrobe's Luft adds that Snapchat is great for building brand awareness and it really can pay off. "A bigger base on Snapchat could and may likely equate to more business and higher profits," he continues. Anna Osgoodby of the Web design firm Bold & Pop says "if you are a brand that has an engaged audience on other platforms and personal or behind-the-scenes updates to share, then Snapchat may be a good fit." She says Snapchat can be a great platform for publications, personalities, bloggers, and brands with an active culture or events. "Once you've decided Snapchat may be right for your brand, the key is to create content your users can't get on your other platforms and making it personal," she adds. You can use Snapchat to give followers a behind-the-scenes look at your business and announce upcoming products, or services, says Erin Pearlman of Appleton Creative. "Some businesses have even begun revealing concepts or ideas on Snapchat, and letting users provide feedback," she continues. "It's a way of speaking with your audience that's more personal than platforms such as Twitter, where voices can often be lost in the mix." With customers who have already done business with you, suggests Matthew Mercuri, digital marketing manager for Dupray, Inc., a company that sells steam cleaners and irons. "When customers get a follow or add, they're significantly more likely to follow you back," he explains. "Moreover, you can narrow down and eliminate the people most likely to ignore you on social media." As you can see, Snapchat can be a useful platform. The picture-heavy site can promote a creative and living conversation between you and your shoppers. While age and gender do play a role in Snapchat's potential for marketing success, it's a heavy hitter for e-commerce marketing to the under-30 crowd especially. Ethan Schepp assisted with this article.